Does your child roam the house snarling and roaring like a prehistoric dinosaur? Maybe it's time that he climbed to the top of the food chain with this Child Jurassic World T-Rex 3/4 Mask. It has all of the ferocity from the movie, but it fits on your child's head, turning him into the apex predator in Jurassic Park. We don't know about you, but we were a bit terrified by the realism in the new Jurassic Park movie. It's probably the closest we'll ever get to seeing real dinosaurs in our lifetime. If you want to give your child a prehistoric look that's ready for modern society, then this officially licensed Jurassic World mask is just what you need. The molded vinyl dinosaur, a T-Rex to be specific, mask covers the face and top of the head so you can give your child a full-coverage look for Halloween. An elastic band goes behind the head for a secure fit and the Velcro closure ensures a great fit. 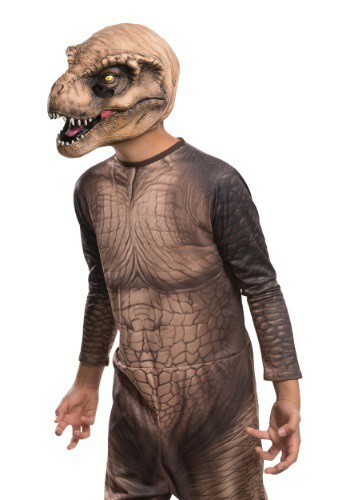 Eye openings just below the T-Rex's eyes will allow your child to easily stalk their prey this Halloween.